10 • RV PRO • November 2018 rv-pro.com O P E N H O U S E C O V E R A G E ELKHART, Ind. – With the annual RV Industry Association National RV Trade Show being reconfigured as RVX and moved to March, the industry's Open House Week in Elkhart took on added importance this year. Not only was it the only chance for dealers to get a look at every 2019 model in one location, it also was RV PRO's only chance to honor the best of the best from North American manufacturers. So, for RV PRO's annual "Best of Show" coverage, the mag- azine's editorial staff switched things up, and in the following pages, presents what is, in our opinion, a good representation of the 20 best models that debuted during the industry's show- case event in Elkhart. With three edit staff members on the ground making the rounds at the displays for Forest River, Thor and all of the independents, it wasn't possible to tour every single model, but what is presented here is a solid representation of the best from nearly every category – motorhomes, fifth wheels, travel trailers, toy haulers and truck campers – and from manufac- turers big and small alike. What follows is admittedly subjective, but based on the opinions of three writers with decades of experience covering the industry among them. 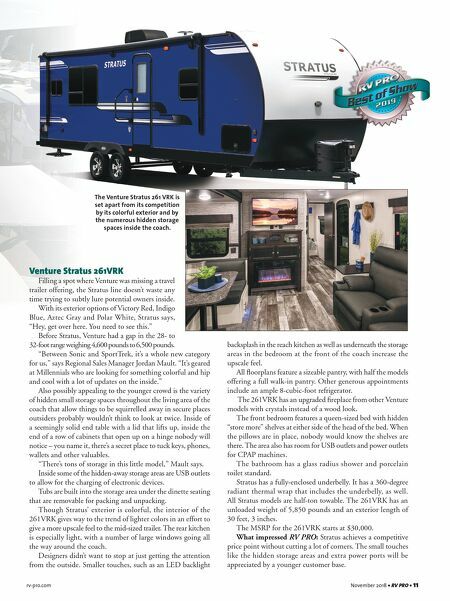 RV PRO's edit team looked for quality, for innovation, and frankly, for that "cool" factor that will connect with RVers – especially the emerging group of Millennial buyers. One positive development RV PRO's team spotted repeat- edly while touring RV makers' 2019 models: The fact they are touting their quality control and PDI processes and highlighting their warranty guarantees. 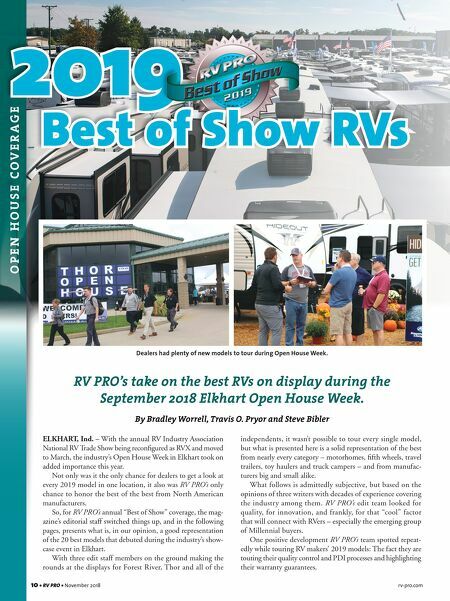 RV PRO's take on the best RVs on display during the September 2018 Elkhart Open House Week. By Bradley Worrell, Travis O. Pryor and Steve Bibler 2019 Best of Show RVs Dealers had plenty of new models to tour during Open House Week.